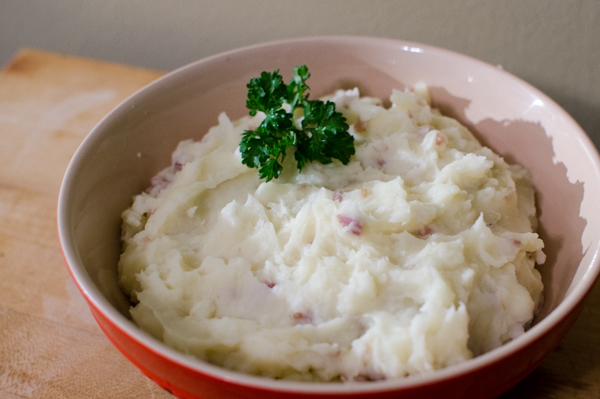 Super buttery, garlicky, creamy, mashed potatoes are one of my absolute favorite foods. So it didn’t take long for me to come up with a Whole30 mashed potato recipe that lived up to my high standards. As a child, I was a bit of a mashed potato snob. I’ve heard stories of how I would only eat the most worthy, smooth, creamy, lump-free mashed potatoes — anything less than perfection was deemed inedible. Over the years my tastes have only grown more refined (hah! ), and with much trial and error, I have found the perfect formula for producing perfect potatoes every time. This is a really simple recipe. It doesn’t take long to make, it only has a few ingredients, and there are only a couple of steps to follow. So these Whole30 mashed potatoes are perfect for a busy weeknight, or you can make them at the beginning of the week and eat on them for days. YUMMM. I know you want to get on to the mashed potatoes, but let’s talk cashew milk real quick. 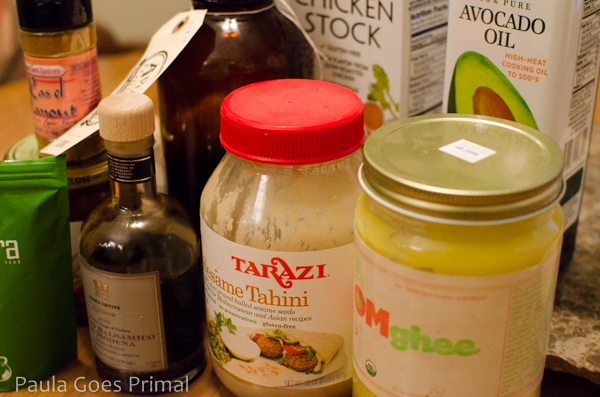 There are a lot of really crappy cashew milks out there with a ton of weird ingredients in them. Ew. Don’t get those. Please, just do not. My recommendation is to either make your own cashew milk, or go to a healthy food store like Whole Foods and find something that only has cashews, water, and salt. 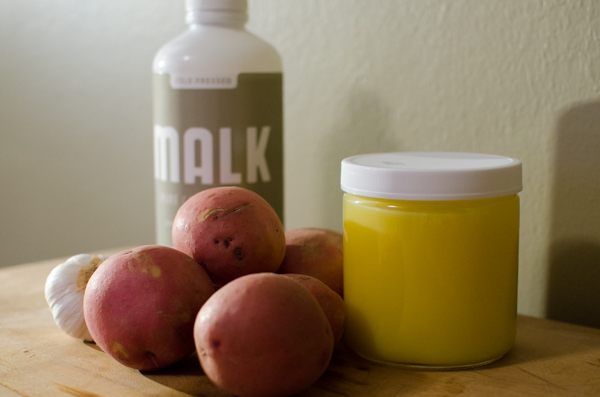 The brand “Malk” is a great option, and it tastes amazing. 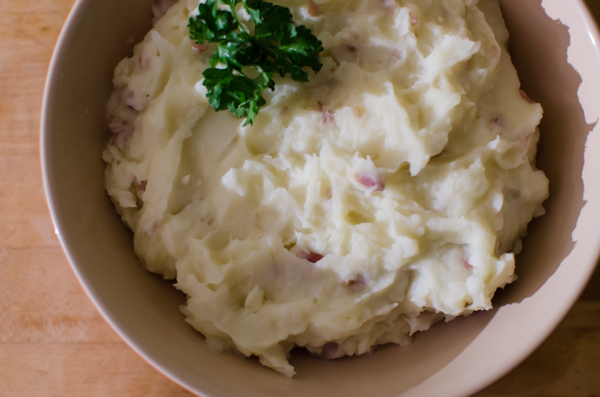 It’s very creamy, so it’s perfect for mashed potatoes! And the mashed potatoes would not be complete without some delicious ghee. I put one quarter cup in mine(! ), but feel free to add a little at first and keep adding until you are satisfied with the flavor. If you don’t like garlic, go ahead and leave that out, but I REALLY don’t recommend it. 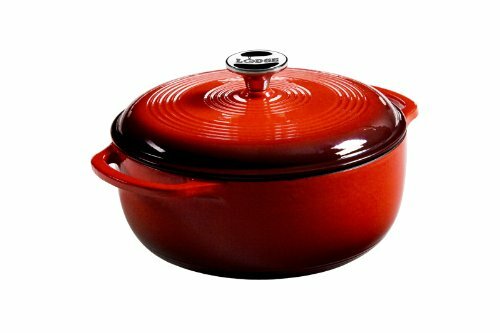 Fill up a large pot with hot water, and place it on the stove on medium high heat. Wash your potatoes (about two pounds, but I never measure exactly) with a vegetable brush and cut them into small chunks. The smaller the chunks, the quicker they will cook. You could peel them before chopping, but I like to leave the skins on mine! Add the potato chunks to the water. They will need to boil for about 15-20 minutes, or until they are easily broken apart when you stick a fork in them. In a large bowl, or the bowl of a stand mixer, add the ghee, cashew milk, chopped or crushed garlic (I like to use a garlic press), and salt. When the potatoes are done, drain off the water and let them cool for about 5 minutes. Then, add them to the bowl with the rest of the ingredients, and mix on medium high using a hand mixer or the whisk attachment of your stand mixer. Mix until the potatoes are fluffy and as lump-free as you like them. Just be careful not to over mix them as they will essentially turn to glue (nasty, yucky, sticky mess that is no fun to eat). Taste the potatoes and add more salt, ghee, or cashew milk, if desired. I usually have to adjust a little bit. Serve immediately or store in the fridge for 4-5 days. 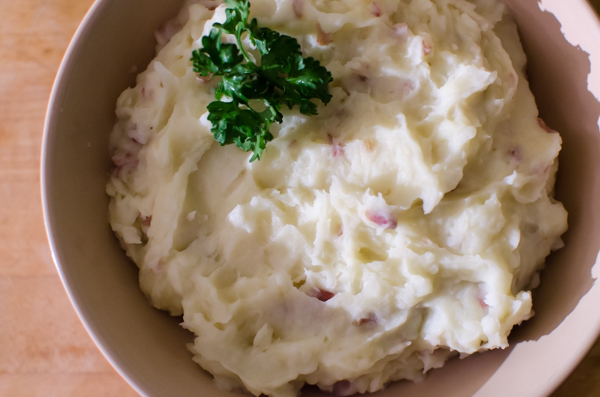 Easy, "buttery," creamy, and garlicky...the perfect Whole30 mashed potatoes! Place a large pot of water on the stove and turn heat on to medium high. 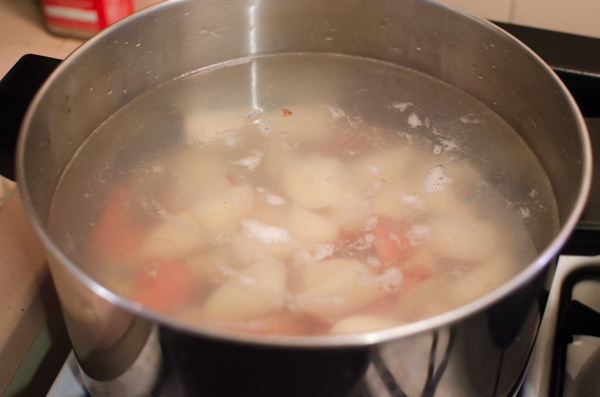 Wash and chop the potatoes into small chunks, about 1" and add them to the water. Make sure water comes to a boil. 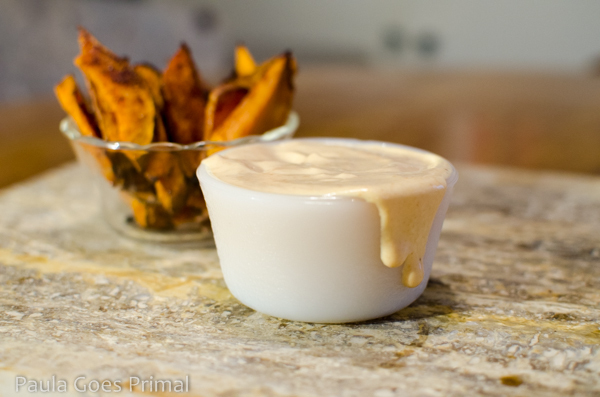 Place the garlic, cashew milk, ghee, and salt in a large bowl or the bowl of your stand mixer. When the potatoes are soft enough to break apart easily with a fork (usually 15-20 minutes), drain the water off in a colander and let cool for about 5 minutes. Add the potatoes to the bowl and mix with a hand mixer or the whisk attachment of your stand mixer on medium high until the potatoes are fluffy and smooth. DO NOT overmix! This will result in sticky, "glue-like" mashed potatoes. Serve immediately or store in the fridge 4-5 days.